We’d love your help. Let us know what’s wrong with this preview of All the Perverse Angels by Sarah K. Marr. A chance discovery in the cottage's attic leads Anna on a journey back to the late nine Anna, an art curator, leaves a psychiatric hospital and finds herself in an English village, sharing a rented cottage with her partner. Seeking refuge from the aftermath of past infidelities, she constructs a personal reality from the brushstrokes and histories of her favourite artworks. A chance discovery in the cottage's attic leads Anna on a journey back to the late nineteenth century and the complicated relationships of two women studying at Oxford University. As Anna's investigations blend with the students' story, and the threads of her life intertwine with those of a century earlier, she finds a way to run ever farther from her pain. But the past is not all it seems, and Anna's escape routes are taken from her, one by one, until she must face the truth of her present. To ask other readers questions about All the Perverse Angels, please sign up. "van gogh's church is all curves in a miraculous balance. his church buckles and looms, but never seems precarious. in places it resolves into the straight lines of buttress and tower window, providing subtle anchors for the building. my church was everywhere perpendicular, or, at least, that's how i saw it. the fault might have been with my eyes, or vincent's." i'm so profoundly surprised by this book. my first few steps were hesitant; there was something self-conscious, almost laboured, in the "van gogh's church is all curves in a miraculous balance. his church buckles and looms, but never seems precarious. in places it resolves into the straight lines of buttress and tower window, providing subtle anchors for the building. my church was everywhere perpendicular, or, at least, that's how i saw it. the fault might have been with my eyes, or vincent's." i'm so profoundly surprised by this book. my first few steps were hesitant; there was something self-conscious, almost laboured, in the narration, in anna's abstracted, disoriented perspective, in the artful evasion of naming the painful thing - as though, like ophelia, she was a figure "incapable of her own distress", trauma manifesting in a sort of fragmented multiplication, other people, other words, other stories spilling from her, forming the absence of herself in the middle, a negative space. i wasn't sure that i could trust marr with this heavy, hurting thing - sometimes that evasiveness is a device, to carry the plot to a moment of complete emotional nakedness, a sort of grotesque theatre of suffering, and i didn't want that. i could fill in the gaps for myself, i didn't need any more colour, i didn't want the climax of the book to hinge on the stripping away of anna's secrets, from herself or from me. but the further i read, the more i realised that marr was doing something entirely different, something subtle and interesting and moving; it is a book of 'talking-around', of association and identification, of asking every question except the one you need to, of finding answers scattered in words and images from other lives. Was it the title or was it the cover? Either way this book appealed to me. We start off with Anna and Emily in the Cotswolds. Anna is "recovering" from something, Emily is her partner and looking after her. I found the writing lovely however I confess to being a little confused at times. The story switches to Victorian times (mostly around 1887) and a very new Ladies College in Oxford. There is a painting that links the two threads and art is a very important part of this story. The story then sw Was it the title or was it the cover? Either way this book appealed to me. We start off with Anna and Emily in the Cotswolds. Anna is "recovering" from something, Emily is her partner and looking after her. I found the writing lovely however I confess to being a little confused at times. The story switches to Victorian times (mostly around 1887) and a very new Ladies College in Oxford. There is a painting that links the two threads and art is a very important part of this story. The story then switches between Anna and Emily in current times and, mainly, Penelope and Diana in Oxford. While Anna is the star of the show the developing relationship between Penny and Diana is key to this story. In a sense this is a quest for knowledge and understanding of the painting that Anna finds and is maybe part of her recovery process. Other than the fact the her issue seems to be a mental one little is made directly of Anna's problems. However they do manifest themselves. I found myself completely engrossed in Anna as a character. I'm not well versed in "art" and I think people would get more out of this book if they were. However Anna is a very well crafted character. Flawed, alive, interested, puzzling and much more - great. I guess the other characters, while good enough, suffer by comparison. Even Penny (Penelope) ,who is probably the other key person, simply feels two dimensional by comparison to Anna. The quality of the writing and creativity of this book is very good indeed. There is a warmth of humanity here even in parts of the book where things look quite bleak. I would argue that the early part of the book feels rather slow and it did take me a little while to grasp the story properly. However the pace stepped up as the book went on and I became more involved. I'd give the caveat that it is very art orientated and that will not suit some people. There is more to this than simply the parts though. There is a wonderful dream like quality to the writing at times. It is all enveloping in a comfortable way too for me. I am very glad I read it even if I can't say I loved it. I was blown away by this - it's been ages since I read a book that I could sink completely into just for the quality of the writing. It's surprising and beautiful (and occasionally very funny) and I really didn't want it to end. All the Perverse Angels was well out of my comfort zone, but the characters are so well realised that I found myself completely absorbed from the first page to the last. READ IT. I have put down All the Perverse Angels, and sadly so, because it has been my friend these past few days. Sad for other reasons.....but stimulated and enriched. That is a sign of a really fine book; and this surely is one. I felt some intellectual complicity with Sarah/Anna, for which I have little justification because I have none of her talent for vivifying works of art. I was carried as an enchanted observer to the romantic relationships. I found myself recalling Brideshead; not just the loca I have put down All the Perverse Angels, and sadly so, because it has been my friend these past few days. Sad for other reasons.....but stimulated and enriched. That is a sign of a really fine book; and this surely is one. I felt some intellectual complicity with Sarah/Anna, for which I have little justification because I have none of her talent for vivifying works of art. I was carried as an enchanted observer to the romantic relationships. I found myself recalling Brideshead; not just the locations, the liaisons and their effect on others, but the emotional rhythm of the work and its denouement. Angels comes out well from these reflections. Wonderful, clever, occasionally heartstrings-tugging, this is a beautifully written debut. Deserves to be entered for a few literary awards. Read it. You'll love it. 'All the Perverse Angels' is Sarah K. Marr's debut novel and is breathtakingly written. It weaves together two core narratives separated by over a century, though linked together through art and diary entries in a very pleasing way. The book deals with the profundity of loss and identity, conceived and delivered with striking intelligence and thought; it is easily the most accomplished novel I have read in some time. At the heart of it is the emotional and intellectual link between our two heroi 'All the Perverse Angels' is Sarah K. Marr's debut novel and is breathtakingly written. It weaves together two core narratives separated by over a century, though linked together through art and diary entries in a very pleasing way. The book deals with the profundity of loss and identity, conceived and delivered with striking intelligence and thought; it is easily the most accomplished novel I have read in some time. At the heart of it is the emotional and intellectual link between our two heroines (Anna and Penny) and art, with a specific focus on one painting. However, there is a great deal of allusion to the wider artistic world, with some (quite wonderful) descriptions of particular paintings, yet on a number of occasions, they brought the flow of the narrative to a standstill for me, which unfortunately weakened the connection I was developing with - particularly - Anna. I can quite easily see how another reader may indulge in sinking into such passages and feeling all the more attached to Anna and swallowed by the story; but for me, there was a little too much of it - like being given a pint of port, instead of a tumbler - which is a shame, because I would have enjoyed the novel a little more if it were about 50 pages shorter. Despite my feelings, I do see that the allegorical references to specific pieces of art are meant to serve as a deeper, more rewarding conduit through which the reader can relate to and understand the characters. I should imagine many readers will love that. There's pleasure and anxiety in picking up something by a debut novelist: you really don't know what to expect. But you won't have got far into All the Perverse Angels before realising that Sarah K Marr is a writer with an assured and individual voice. I loved this book, and it did remind me of two others I've loved: AS Byatt's Possession and (perhaps more relevantly) Peter Ackroyd's Chatterton. There's something in the way all three novelists explore the deep resonances between lives lived in d There's pleasure and anxiety in picking up something by a debut novelist: you really don't know what to expect. 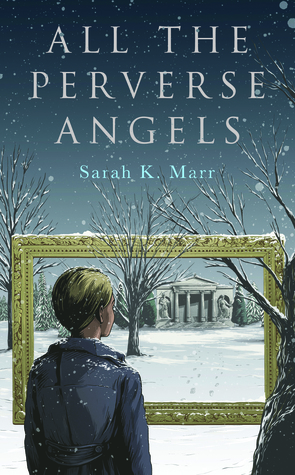 But you won't have got far into All the Perverse Angels before realising that Sarah K Marr is a writer with an assured and individual voice. I loved this book, and it did remind me of two others I've loved: AS Byatt's Possession and (perhaps more relevantly) Peter Ackroyd's Chatterton. There's something in the way all three novelists explore the deep resonances between lives lived in different eras, and how these can be transmitted - or half hidden- through art. But the central story here - the tale of Anna and her recoveries and setbacks, her losses and gains - is all Marr's. The recreation of Penny's Victorian journal is so convincing that I began to doubt it wasn't real - to believe that it was a document as genuine as those paintings that are discussed, which you can go see at the National Gallery. It's a fantastic feat of ventriloquism, but it's also a tribute to the truthfulness of Marr's writing throughout. Once in a decade or two there comes along a writer who does dazzling things to my brain. That makes me want to write more, to read more and to live more. It happened with Somerset Maugham, Jean Rhys, Lesley Glaister, Simone De Beauvoir and now, again with Sarah K Marr’s, ‘All The Perverse Angels’. The publisher described it as a quiet book and I would agree but only because great literary fiction is often labelled as such. But this book is also vocal, pioneering, candid and accessible. And it is me Once in a decade or two there comes along a writer who does dazzling things to my brain. That makes me want to write more, to read more and to live more. And it is meaningful in so many ways on a personal level. The multiple losses that Anna experiences, the aspect of society that reduces mental health issues in women and minorities as tiresome, borderline hysterical or hormonal and learning how to express our sexuality on our own terms and in ways that don’t always fit with the media’s 'fluffy kitten' version of PRIDE & Sydney Mardi Gras. This is a book that should win prizes. That should be read in loud places and quiet spaces, at Oxford and Aberdeen, in bed and during August storms. Great literary fiction is alive and well and can be found in 'All The Perverse Angels' by Sarah K Marr. A brave and beautiful novel that deserves our attention and regard. Thank you a Unbound and Netgalley for the opportunity to read this ARc in return for my honest review. This is an engaging debut novel based around the stories of two different characters, from different times. If you love art and language you will love the way this book has both woven throughout. Anna is an art curator who suffers from mental illness and who is seeking refuge. This book starts slowly but it drew me in and left me wishing for another book by this new author soon. Judging by all the rave reviews, I am obviously missing something here. I couldn’t get into this book at all. It was long-winded and I struggled to finish it. Such a brilliant, wonderful book. I loved it. If you're a fan of Sarah Waters, I think you'll love it too. This review has been hidden because it contains spoilers. To view it, click here. One of the dangers of writing a novel with two separate timelines is that one part of the book ends up significantly more readable than the other. This was certainly the case with All The Perverse Angels. I've been fascinated by Yde and Olive (Thomasin and Olivia in this version) ever since I first encountered them in Emma Donoghue's Inseparable, so I loved the Victorian sections of the story. Secret lesbian romance with a dash of Pre Raphaeliteism set at Oxford? Get in! The same can't be said fo One of the dangers of writing a novel with two separate timelines is that one part of the book ends up significantly more readable than the other. This was certainly the case with All The Perverse Angels. I've been fascinated by Yde and Olive (Thomasin and Olivia in this version) ever since I first encountered them in Emma Donoghue's Inseparable, so I loved the Victorian sections of the story. Secret lesbian romance with a dash of Pre Raphaeliteism set at Oxford? Get in! The same can't be said for the framing device, as I increasingly began to see it. I've seldom been more aggravated by a fictional character than Anna. Childish, self obsessed, pretentious and unbearably annoying, her illness may partially explain her behaviour, but not all of it. I couldn't blame Emily for having an affair, and marvelled that she still put up with her. Normally I hate the "Woman cheats on her female partner with a man" plot, but wouldn't you if your other half was only interested in herself and art? And attempting suicide over it? Grow up! I grew exasperated with the endless descriptions of paintings and artists - yes, she's an art curator, she's deluded, we get it. Enough already! These reservations aside, the story was enjoyable enough until the last quarter, where it fell apart like a chocolate orange. Emily turning out to be dead might have been intended as a twist, but it seemed only the latest appearance of a clichéd trope I'm fed up with seeing. I don't buy the idea that Anna was prostrate with grief; she simply didn't seem to care her lover had died, which only deepened my dislike of her. This is a novel in which chapters alternate between the present day and the late nineteenth century. I have read books in which this is a clunky device, but in All the Perverse Angels there is a gradual and genuine coming together of the parallel stories, until they read almost seamlessly, and very effectively, as one. I really liked the way in which Anna, the narrator of the present day story, brings in descriptions of pictures. I could see them so clearly, and they contributed really well to u This is a novel in which chapters alternate between the present day and the late nineteenth century. I have read books in which this is a clunky device, but in All the Perverse Angels there is a gradual and genuine coming together of the parallel stories, until they read almost seamlessly, and very effectively, as one. I really liked the way in which Anna, the narrator of the present day story, brings in descriptions of pictures. I could see them so clearly, and they contributed really well to understanding her and her state of mind. I also very much enjoyed the story of Penny, Lady Diana and the minor pre-Raphaelite painter Matthew Taylor. And there's a nice twist! I just would have liked the relationship between Anna and Emily to be fleshed out a little more. Given its importance in Anna's life I felt it was more of a sketch than a painting. Overall, though, a lovely book. This book absolutely enamored me. It's so well balanced between the two timelines, and the characters are also all around endearing and sympathetic. It is definitely written and best appreciated by art and history lovers/scholars. If I had any criticism, I would say that a bit more exposition behind Emily's character would be advantageous towards a better climatic resolution. Overall though, this really is a stunning debut. I hope Marr stays at her craft. A wonderful read with an amazing set of characters. Anna and Emily's relationship is my favourite part of the novel - for all the grand, sweeping themes Marr weaves throughout the novel it's the heartfelt relationship between these two characters that stood out to me. A beautifully written and accomplished debut. Warm and engaging, wearing its deep intelligence lightly, All The Perverse Angels is a thoroughly satisfying and thought-provoking read. Strongly recommended. Sarah K. Marr started writing fiction at school, but got distracted. After studying law, anthropology and theoretical physics at the Universities of Oxford, Manchester and London, respectively, she finally returned to her first love and wrote "All the Perverse Angels". She lives in London, where she spends too much time in art galleries and buys too many second-hand books.